Beyluxe is the latest instant messenger which is still in early Beta stage. Along with basic chatting it also offers group video calls, public/private chat rooms & free video conferencing services. Like most of IM clients, Beyluxe also stores the user account details including passwords in the registry for subsequent logins so that user do not have to enter the password every time. Note that the password is stored only if user has selected 'Save Password' at login time. Actual encrypted password is stored under above key with value name as 'Password'. Coming back to Beyluxe, let us retrieve the encrypted password from the registry. It may look similar to '229226264233285234272' which is my encrypted password for BeyluXe, Just this alone tells us a few info like the length of the original password. Divide the length of this registry password string by 3 and you will have the length of the original password. In my case the length of the encrypted password is 21 characters in length, so that would make my original password Length 7 characters long. We wont need to concatenate this string because its already longer than Unencrypted password length, The next stage is the mathematical part. This is where our Encrypted password from the registry comes in to play, So we know our password is 7 characters long(by dividing Encrypted password by 3) and we also know the encrypted value for each character of our password. Now would be a good time to get familiar with the ASCII chart and understand for each character of the alphabet there is a decimal and a hex representation, So with that in mind we do something like this to decrypt (in Delphi) the first char of the password. Finally subtract 116 from it to get the nth char (for first step, it is '1') of original password. 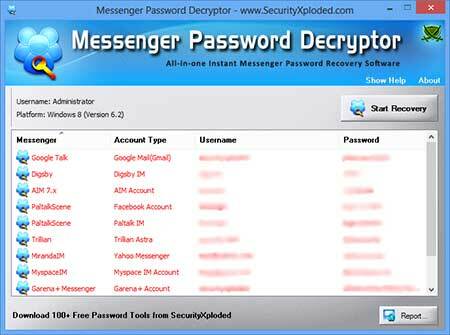 Keeping the above logic lets decrypt the rest..
MessengerPasswordDecryptor is the FREE software to instantly recover stored passwords from most of the popular instant messengers. Most of the messengers have the auto-login feature which requires the user account information including password to be saved in encrypted format for subsequent logins. MessengerPasswordDecryptor helps in instantly recovering such stored passwords for popular instant messengers. You can use MessengerPasswordDecryptor to automatically recover all stored passwords by Beyluxe Messenger for all nicknames. It is portable tool and works across wide range of platforms starting from Windows XP to Windows 7. In nutshell, above article explains how Beyluxe messenger encrypts and stores its account password. In the second part it shows how one can decrypt such encrypted password to recover the original password. Note that above decryption process is based on early beta version of Beyluxe Messsenger and it may change with upcoming versions of the Messenger.